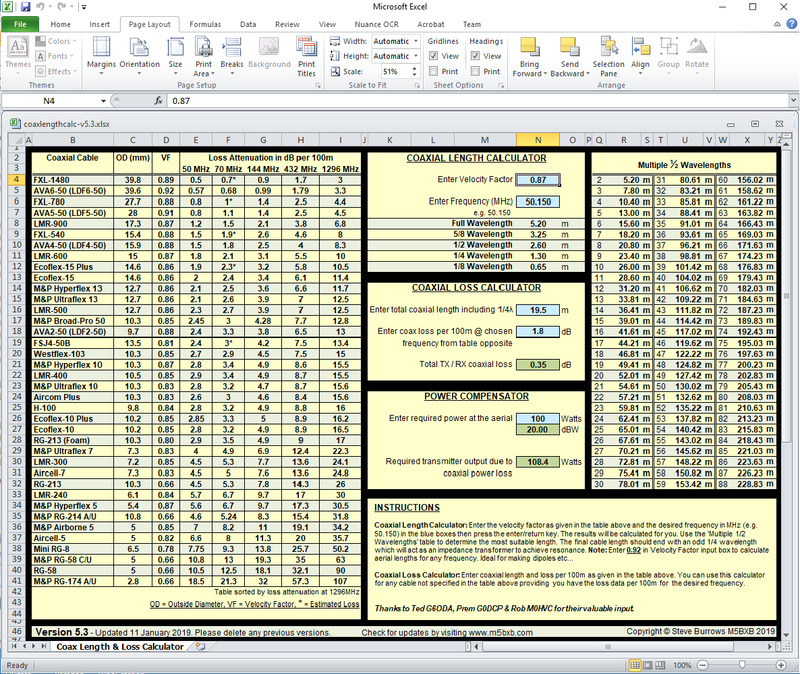 Coaxial Length Calculator Version 5.3 Free Download (uses Microsoft Excel) Updated 11th January 2019. What is the correct length of coax to use between your transmitter and aerial at VHF, UHF and Microwave bands, or should there be a correct length? Some say it does not matter and any random length will do as long as it reaches where it needs to go. The next question is. What coax should I use? Some say it does not matter as long as it is of the correct impedance. Now we ask the question. How much power is being radiated by the aerial? Many believe that if your transceiver has an output of 100w then that is what the aerial is radiating .... But is it? At this point, let it be said that a random length of coax will work at the correct impedance but the question remains as to the efficiency of the coax. The aerial is a tuned resonant device with a nominal impedance of 50ohms set for maximum gain at the chosen frequency. As we know the transceiver is a variable tuned resonant device capable of receiving and transmitting at the chosen frequency with an impedance of 50ohms. It makes common sense to make the transmission line match the aerial and transceiver for maximum efficiency from the system. Therefore the answer is a tuned transmission line. In the case of low HF frequencies this may not be practical due to the long lengths that would be required. All coax cables have a velocity factor and will have some loss along the length. The losses are more noticeable in the higher frequencies. So to determine which coax to use, the questions to ask yourself would be. Which Frequency is the coax to be used for? What length do I need and importantly how much of my transceivers output power do I want at the aerial? At VHF/UHF the choice of coax is important to minimise loss on both transmit and receive. Below is a screenshot of a Microsoft Excel based calculator which is a valuable tool to simply and quickly calculate coax lengths and losses. You can download Coaxial Length Calculator for free but you will need Microsoft Excel to use it or another spreadsheet program capable of using Excel. You can see from the screenshot below a comparison table of coaxial cables. Which one are you using? In the example below, the frequency given is 50.150 and the chosen coax velocity factor is 0.87. You can see the calculator has worked out the electrical lengths which should be used. A quick look at the table on the right displays the multiples of half wavelengths. Your coaxial system including patch leads should be made up of multiple half wavelengths with an odd quarter wave which will act as an impedance transformer to achieve resonance. If you do this, you will get the maximum performance from your chosen coax. You can use the Power Compensator to calculate dBW. Just enter any power in watts and the calculator will convert it to dBW. You can use the Coaxial Length Calculator for any cable that is not shown in the table providing you know the velocity factor and loss per 100m at any frequency you wish to use. Now we have dealt with coaxial cables, we should turn our attention to the various connectors and their losses. John Huggins KX4O has provided detailed analysis on his website http://www.hamradio.me/connectors/uhf-connector-test-results.html and makes for very interesting reading.